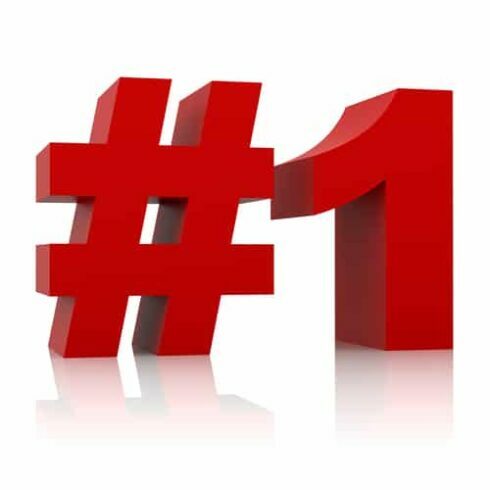 I am excited to officially announce that my public niche site has reached the #1 spot in Google! 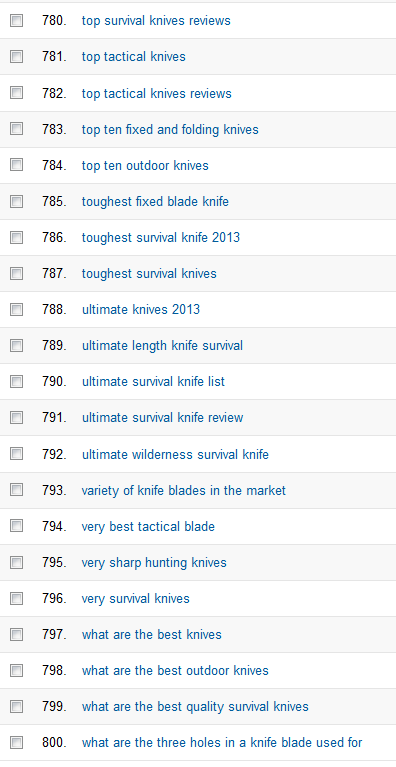 My niche site began ranking at the top spot in Google sometime yesterday for my primary keyword of best survival knife. If you have been following along with my Niche Site Project, you know that I have gone to great lengths to explain my entire process along the way. In fact, before I even started the site, I recorded a webinar explaining what my strategy would be and how I would go about finding my primary keyword, launch the site, and more. Obviously being a project for everyone to watch, I had high hopes that this site would reach the number one position in Google, but I also knew that having thousands of people watch along can sometimes impact results (positively or negatively). So, I'm thrilled (to say the least), that my site has performed to my highest expectations! So, how did I get my niche site to the top of Google? In my post today, I am going to reveal more details on some of the tactics I've used, along with a complete overview of what has happened to my site – including earnings, rankings, and more. Ideally, you will be able to take some of this information and find success with it in your own niche site endeavors. Feb. 22nd, 2013 – First Article Published (62 days from this date, I ranked #1 in Google). March 9th – 237 (See my explanation for this drop and recovery here). APRIL 24TH – #1 IN GOOGLE BABY!! Now there were more minor movements up and down than what I've shown, but this gives you a general feel for its progression over time. I am VERY happy with $254.10 in earnings for this month so far! In fact, you may remember that I just posted an earnings screenshot a few days ago…and it was $174 (through April 21st). Part of the increased earnings over the last few days is that I hit the 7% commission tier rate on Amazon! As you can see, I have shipped 112 items, so my commission rate was bumped to 7% retroactively on ALL the sales I've made in the month of April. So, I had a nice earnings increase…sweet! I expect things to get even better as I enjoy the increased traffic from being in position 1. I wanted to take you back to the very beginning of the project when I began looking for a keyword to target. I have stressed over and over again that keyword research is by FAR the most important step in building niche websites. I think that I've proven that with this project. If you find a keyword that is easy enough to rank for, you won't need to build as many links to your site – and you will be much more likely to rank at the top of Google. I wanted to target a keyword that had 5,000 exact match searches or more for this project and find one that had low competition in the top 10 spots of Google. I used my keyword research tool, Long Tail Pro, to brainstorm, research, and find my winning keyword. I found the keyword “Best Survival Knife”, which had just under 5,000 exact match local searches, and also had very low competition in the top 10 results in Google. I felt strongly by analyzing those results (and using the built in Keyword Competitiveness function in the Platinum version of Long Tail Pro), that I could at least get on the first page of Google. You can watch videos of me finding this keyword and read much more details right here. So, even though I am now going to explain below everything else I did to rank this site in Google, I want to strongly remind you that the keyword research is the real reason I am able to rank in Google. If you fail this step, it doesn't matter how much other “SEO” tactics you use. As I explained early on, I wanted my content to be super valuable to the end user of my survival knife site. To be honest, its very possible to still rank a site with less than stellar content – as long as you do great keyword research and some basic link building. However, I wanted to make this site something I could be proud to share and to truly be useful to those searching for survival knives. So, I wrote the primary article myself (homepage) and created an in-depth knife comparison chart. The article is using my primary keyword in the title and is overall targeted the keyword I want to rank for. The article and chart took me several hours to complete, but as a result, I think my site REALLY is more useful than the other sites that are ranking in Google right now. In addition, I've now hired (on Elance.com) a camping and survival expect to write lots of the content that you see on the site. This author is providing secondary articles that each target different keywords; mostly different knife makes and models. These articles are well written and provide a unique voice from someone that truly understands knives and what to look for (better than I could). As a result of my quality chart and other quality content, users are spending more time on my site. This time on site, or more accurately “Dwell Time”, is providing a positive signal to Google. This helps my site do well. The average user is spending 2 minutes and 38 seconds on my site. Now I come to the section that I suppose many of you have been waiting for. I'm going to give you a detailed look at the exact link building that has been done on this site. And yes, this has helped me rank #1 in Google. I was ranking #25 in Google on March 1st…BEFORE I built a single link to the site. I mention this to just remind you how important my keyword research was. I was ranking purely on the fact that I was targeting a low competition keyword and built a site using a theme that I created. March 7th to around March 21st – I started making about 20 or so comments on related blogs. These comments were made by me, and were real comments (not spam). They were related to the blog post and were genuine. I didn't use keyword anchor text other than my name or sometimes Spencer @ Survival Knife Guide (or something similar). Also during this time period I had my VA build between 10 to 20 (not sure how many got accepted) web directory links. These were just general web directories with high pagerank. You will see that around March 15th or 16th, my site started ranking on the first page of Google. I believe my keyword research, quality content, blog comments, and web directory links helped my site make the jump. On March 21st, I secured a quality in content link from an authoritative site related to weapons and knife reviews. This is the only link where I used my exact match anchor text of “Best Survival Knife”. I haven't talked about this link up to this point, but I share more on this below. In a nutshell, I used a high PageRank expired domain to “trade” links. Was it this link that pushed me to #3 in Google on March 26th? Very possibly. On March 25th, I started noticing lots of links being built to my site that I DID NOT build! I wrote an entire post on what I believe is negative SEO from someone towards my site. The big question that everyone has (including me) is did these links help my site…or will they eventually hurt my site? I don't know the answer, BUT I do know that I would have ranked without them just fine. You see, I was already on the first page of Google before they showed up (and position 25 before I ever built a link). And as I'll show below, it was clearly my link building efforts that pushed me from just page 1, to Top position. I would have made it just fine without these links, so its unfortunately that I couldn't prove that…because these links did indeed occur, and I have to acknowledge that. So, make your own call here. I continued to make just a few more blog comments on related blogs through about the end of March. I only made another 5 or 6 more. On April 11th I hired someone to start building links for me that fit very close to my original plan as shared here. This link building job was completed on April 22nd. My site went from position 3 to position 1 during this timeframe…you be the judge! I want to share EXACTLY the links that were built during April 11th to April 22nd – and I've shared that below. As explained, I hired someone to build some links for me. Below you will find a list of exactly the work that was done during this time period. Also as a note, I did not use the term “best survival knife” as my keyword anchor text on any of these, because of the negative SEO links I had received that overused my keyword anchor text. These links were various phrases to help diversify that anchor text. Those are all the links pointing directly to my site. (Notice its not a HUGE number of links…other than the social bookmarks. And likely most of the social bookmarks won't “stick” anyway). However, I also had a second tier of links as I explained in my original link building guide. Here's the kinds of links I got for my second tier links (links NOT pointing to my site, but pointing to my other links above). 2500 blog comments (yes these were probably automated and really crappy links. But the sole purpose is to just index and boost my other links). Overall, those are the links built to my site in the past couple of weeks. The articles used were original; however, they were used over and over again. In other words, the 3 GoArticles.com articles may have been original, but a slightly spun version of these same articles were used on the Web 2.0 properties and other locations. As I mentioned above, on March 21st, I secured a high quality link from a great site about weapons, knives, and more. I was able to get in contact with the owner of the site and I basically offered him a high PageRank link from an existing domain I had access to (that had been an expired domain). So, the owner of the site agreed and wrote me a “guest post”. I place this guest post along with links back to his blog that he created on the High PageRank domain. In turn, this person placed an in content link from his site to my survival knife site. So, essentially it was a 3 way link. None of the links are pointing to each other. Hope that makes sense. Overall, this is a great way to use Expired Domains to attract high quality links to any of your web properties. I actually could do this a lot more if I needed to. I currently have 2 webmasters interested in trading links, but I may not need to at this point. How Are People REALLY finding My Site? I am going to provide a more detailed report on traffic and earnings once the full month of April is over. However, I thought you would find it interesting to know how people are actually finding me on Google. Obviously lots of people are typing in “best survival knife” into Google and are finding me. But the exciting part is that I'm getting TONS of traffic from related long tail keywords! So, yes, I'm getting some traffic from my blog readers here at NichePursuits.com. 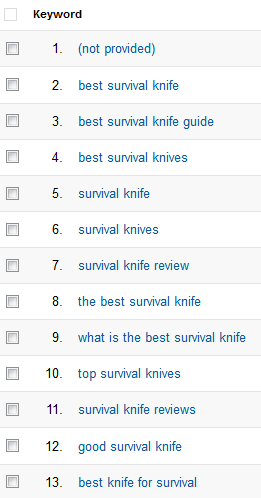 Some of you are typing in “best survival knife guide” (as you can see from the top image), and that's fine. However, I can see that most of the keywords used are NOT things that my blog readers here are typing in. This is natural search engine traffic from people performing real Google queries. I currently have 22 articles on the niche site that are all being found by people using Google. I intend to continue to add more content throughout the month of May as well, so I only expect the number of long tail phrases used to find my site to increase with time. I've done my very best to explain how I have achieved a number 1 ranking in Google after just 62 days with my niche site. If you still have further questions, you may be able to find some of those answers in the several updates I've posted specifically for this project right here. I will continue to provide updates and future plans for this niche site. I'm currently building an email list and have plans to start monetizing with other affiliate products. I will be covering these plans and more in future posts, so I hope you will stick around for sure. I fully understand that many of you will have further questions or comments in regards to this project, so I invite you to leave a comment below! Because this is a project that I've done publicly from the very beginning I'm fully aware that some of you will have positive comments and some of your may have negative reactions to what's happened. But overall, I just want to state that what I've shown here is essentially what I've done “privately” with hundreds of other niche websites that I own. I've ranked #1 in Google many times before, so the tactics that I've laid out work. I truly hope that some of the information that I've provided here and along the way will help some of you improve your own business and achieve the success you are looking for. I look forward to hearing your comments and continuing the discussion below! Congratulations Spencer! Great work my friend, and thanks for providing the in-depth blog post about how you got there! For sure. Alex is spot on. Spencer you deserve huge props for this one. I hope people realize how much hard work went into it, and that they know you can still rank a niche website. Also, like Alex has mentioned the in depth content that you have provided is stellar and I appreciate it. I already can’t wait for the next one. This is fantastic news. Can’t wait to employ some of the knowledge I’ve learned throughout this process. Here’s to getting to that $500/mo goal. I second that — here’s to Spencer’s goal!!! He’ll reach it ahead of schedule, I’m sure. A little over a year ago, with help, I made an amateur youtube video titled, “Become a Basketball Pure Shooter!” The video has reached number one on google months ago with these Tag Words. The advice on the video was free of charge. My question: Are there folks out there who could look this video over and opine if they think it has comercial potential and would know how to harness it? Thanks for going into such detail on the links built, this will really help me building my niche sites out. It ads lots of motivation and value for me! Now, that’s the type of premium article I hope to see everybody else who has the guts to experiment with SEO or niche affiliate marketing or whatever to write and report back to the community! It really takes guts to be genuine and transparent with these niche reports. Congrats Spencer, this is awesome!! I can’t wait to dig into this when I interview you for my podcast next week, and my niche site duel part 2. So inspirational, thank you for working overtime to document the process! Can’t wait to see April’s income report for this site! Wow can’t wait for that episode! In my opinion you 2 are the best, honest and most influential people in the Internet marketing world! I 100% agree! You guys are awesome, keep up the great work! I just started building my very first niche site this week using almost exactly what you(Spencer) have talked about through your public project and feel more confident about what I’m doing than anything I have done before. Thank you! Awesome documentary Spencer!! Thanks for all the great details and time you put into sharing this project with us! I’m really jealous. My niche site is almost a year old with what I deem to be some of the best content out there for the niche. But I’ve only peaked at #3 and have fallen to #5 for several consecutive months now. I haven’t really done any link building at all, so maybe that’s what’s holding me back? If so, maybe I should give it a try because I’m really starting to yearn for #1. Hey Benji, its likely that a few good links will help your site out. Obviously you’ve done well ranking your site without links, but Google still values links…worth a try. This has great to follow. There aren’t too many people in the industry showing off their best secrets in public like you do. It takes guts. You deserve all the success that you’re having. And I can’t wait to hear your interview on SPI! Congrats on hitting N1 ! What site you used for creating that graph? Yeah, Serpfox.com. They have a free plan for 10 keywords, I have tried a lot, but I find them the best. Congrats ! That is really inspiring ! Thank you so much for sharing so much of your steps … for us to learn from. Thanks ! Outstanding work Spencer. 62 days is quite fast, and the best part is the money is starting to kick in. PS – just realized you are a Sun Devil… so am I. Quick, elementary question… how do you find out your exact Google ranking? Like, on March 10th you say you ranked 246th… I am assuming you didn’t scroll page after page until you found your site. Is that part of Long Tail Pro? Thanks and congrats again, I have been really enjoying this series, it even pushed me to finally experiment on my own as well! Yes, I used Long Tail Pro. And I have been using a yet to be released feature of Long Tail Platinum that tracks rankings in Google. Gotcha, thanks guys. I am going to check that out. Congrats Spencer and thanks for being so open with all of us. I look forward to trying out your methods on a few sites. Hi Spencer, how do you find DoFollow comments blogs? I followed your guide. My site is ranked on #2 on Google now, it has some traffic but I haven’t got any sale in the last 3 weeks. What I did wrong? Hard to say. Might not be a buying keyword. If you are using amazon, perhaps you should try using Adsense instead. Great article, thanks for sharing, it is really interesting to see how you did it and the steps you took to achieve #1. Just like the Olympic athletes …. you make it look So Easy! Nice job, Spencer! Nice job! This wasn’t very long at all in my opinion to take the top spot. I’m really impressed by the time on the site. Do you think anything else besides the content is keeping users on the site for that long? Anyway you think that figure could be increased even more? I think having the chart definitely has helped. Because its an interactive chart (they can click different columns to sort knives based on different criteria); I’m guessing people are playing around with it. More content might help increase time. But i’m happy with the metric for sure. Spencer glad to see you are getting it all figured out. I agree with you 100 percent. Quality over quantity. Quality whens every time in the ling run. I tell you. Lately seeing the crud that is spewed in the SEO world and especially WSO’s rank in less then 24 hours 😐 These people should be tried for fraud. Seeing something like this is a breath of fresh air. A real true honest plan that is timeless. Sure sure not saying that there is NOT loopholes in google that will let one rank stupid fast. Yet where will they be next month? Crying because google updated and they where hit by an update. Ranking now a days is a very competitive field. The new negative SEO is a big threat not just for spammers but for competitors. I have seen it myself I had a few sites hit with Negative SEO from competitors. In case this happens to you because of haters or whatever. I found a way around this. Google will penalize domains for spam links but not content. You get some haters and you know your content is golden just drop the domain put it up on a new website and just go on. If it is worth it that is. I have been ranking for a very competitive keyword and have went through more then a few domains because of this. You just have to accept this is business and you are turning a profit and whenever there is a profit to be turned you are going to have jealous people trying to take that money because they lack knowledge to make money themselves. Well man I will let you get back to your thing. Good luck! Thanks for the kind words and thoughts! Appreciate it. Good stuff as usual, Spencer, and congrats on the #1 spot. Hopefully you will be able to push this closer to the $1,000/mo. area as you gain more long-tail traffic and find other ways to monetize the site. I believe you worked hard to establish your niche blog so that you got successful. Great stuff Spencer. I’ve been looking for a service or process to get some of the lower quality / directory links built to my niche sites. Unfortunately, everyone is offering 10K directory submissions or social bookmarking which i’m confident would only hurt my site(s). I’m in the process of identifying 10-20 directories and some social profile sites that I can have a VA submit my sites too. Then at that point one or two solid links should help a site bounce to the top very similar to your experiment here. I agree. You may have to find and train your VA to do some of this “lower” end link building. You can also find directory submitter software. This allows you to post to selected directories and as many as you want. So you can do 10 or 15 a day. You can even add your own. So if you find directories specifically for your niche you can add them to the software and then, when you creat Web 2.0 properties you Cana then add these to the directory as well. Congrats awesome to be so open. Will contine to follow with interest. Hoping it stick at one and doesnot drift. At last somebody actually provides valid proof of the correct way to set up a business or project on the internet! This has really helped and inspired me. It’s going to be so useful to me in setting up my niche website (early days so far) as a back up to my recent Kindle book launch. PS I’m now going to make full use of Long Tail Pro which I recently bought from you… and I may even upgrade to the ‘platinum’ version. Thanks for the kind words Paul…best of luck with your niche site! Awesome, Spencer! And big, big thanks for the exact link building. I’m about one month in on my 3 new niche sites, and even though I’m going after low comp keywords, I know that it’s the links that will push me into the top 5. I can’t wait for some traffic to start rolling in. Just gotta keep my head down and my fingers busy on the computer. I have really enjoy watching your progress with the knife guide. You make it look so easy! I am looking forward to learning more about your affiliate strategy in the coming weeks! One question I forgot to ask (that I don’t believe you addressed) – how many of your links were deep links vs. links to your root domain? Congratulations, Spencer. This is definitely something you can be proud of. What about traffic from week to week? I would love to see how those numbers correlate to your timeline. Awsome review Sam. I’m thinking of buying Long Tail Pro from you soon. Your report is amazing. I wish your best survival knife makes you tons of money this year. A lot of work have been done for this project. I’m eager to learn from you. This site will rocks for sure ! Yes you should really get Long Tail Pro. I was using Market Samurai but have switched over because LTP is so much easier to use and quicker. Sure Ms has many other features but LTP does the essentials really well and quickly. Btw I get nothing out of recommending LTP. Just a happy user. I have been following your blogs with great interest and now attempting my first niche site. Fingers crossed! I’ve bought the platinum version of long term pro and it really is an excellent piece of software. I’ll admit this blog regarding using expired domains to build links has confused me slightly but hopefully I will get my head around it! Just one question. The keyword I am considering only has about 2400 local monthly searches. However it has a high CPC and low KC. I don’t have an adsense account yet so my strategy is to rank high in Google and use the site to try and gain adsense. I’ll then worry about targeting higher monthly searches on my next site. What do you think of my strategy? Sounds like a great way to learn the ropes! I say go for it. This is inspirational. Thanks for the informal post. BTW-how many visitors are you getting per day to produce that kind of income? Usually between 400 to 500 uniques. (But some of that is from readers of Niche Pursuits). Congrats Spencer on a great project! You’ve obviously changed your process & method from how you used to build niche sites due to all the “animal” updates. Now I’m curious as to how you would recommend scaling up your new process to increase your overall revenue if niche sites were your primary business model? Or, would you caution someone from attempting to use niche sites as a primary online business model…just curious about your thoughts. Yes, my process has evolved and always will. As shown here, Niche Sites are still a great model. And because I’m focusing on bigger earners, its actually easier to scale up (less sites but more earnings). With that said Spencer, did your total expenses drop drastically? I mean for your whole business overall? The expenses are still similar. I build less sites (so that cost less), but I invest more into each site (more content, etc). What where the number of clicks to get the number of items shipped. ? Right around 5,000 clicks. Just over 2% conversion. Wow… Now I understand I have to work a bit harder..! 1. Did your VA also build links to the inner pages? 2. Can you please share the anchor text list and the ratio that your VA used for link building? 3. Do you recommend on services that offer 3 way high PR domains links? 4. Do you know about a service that build links similar to your VA work that you recommend on? 5. Is the 3 way link is the only one that you use exact match anchor text? 1. Yes, some of those links listed also went to inner pages. 5. Yes. (For the reasons I explained in the post above). That’s remarkable progress in such a short time. It took me about seven months for my first blog to get to number 1 on Google. I haven’t focused it as much for my current blog but probably should. Great job Spencer! And to Kerry, I started my site 2 months ago with Long Tail Platinum and Long Tail Classroom and ranking #7 in google now on my main keyword. If you think the digits are ok, just start. That’s how I got started. You’ll learn along the way. Good luck! Thank you! I appreciate your comment. 🙂 Well done on your #7 ranking! I an amazed at the relative ease with which you got to number 1! Nothing too crazy on the backlinks or content front. Your case study definitely shows the power of keyword research! Spencer, Thanks for being so open with your niche site, it is very timely for me as I am building out a site at the moment too. Although i have built out several niche sites before, i have not had a lot of success ranking them. I attribute this to a lack of link building on my part. I have two questions about the process you outlined above that would help me with my learning curve about proper link building. Which quality free Web Directories do you recommend? I would like your input on identifying good quality free directories. I would also like to know more info about the link building from the 11th to the 22nd. Did you use a VA? Is there a service you used? What kind of price range should I expect to pay for something like this? I used LayeredLinks.com – its $219. Really great stuff, I’ve been re-inspired. My site ranks #2 on google for my primary key word (6000+ local searches) and on the 1st page for others. However, I hardly get any traffic, maybe 20 visits a day, much less any amazon/adsense revenue. I think my next steps are to start blog posting on relevant sites, submit my articles, and build some more links on relevant sites. Is that 6,000 EXACT match local searches (not broad)? You should get much more than 20 visits a day if its truly an exact match. To summarize this – a case study coming to fruition. I’ve learnt a lot about niche sites from this case study alone. Prior to the beginning of this project, I was craving a case study like this, mainly due to the fact that most similar case studies are already dated and many changes have occurred, particularly in SEO, since they were created. So I can’t thank you enough for enlivening niche site marketing again, at least with regard to me :-). I have been following your project since the beginning and boy it has been so inspirational. I already got LTP last month and i have found some keywords that are below 35 so i have 3 sites so far that i’m working on and will see how long does it take me to get them to #1. Thanks for the advice as always. Do you think i should start with 5 o 7 articles and stop until i’m in the first page of Google before i keep adding content? I usually go to at least 10 articles before I stop, just my personal preference though. Then obviously I add more content as I see promise. Congrats Spencer. Your case study has been truly inspirational to someone stuck at their 9-5 like. This shows that I need to keep plugging away until I can quit my day job. I typed up notes highlighting everything you did. I’m on page 2 of google for a local niche site but now I see I really need to start back linking even though the site is only 2 weeks old. Great work Spencer! wow.. I remember reading your first post, and saying I have to try this out! Then my 9 to 5 work got my attention, and my health/self help blog… Now I’m fired up again to try out niche sites! Are you planning on compiling the posts to form an ebook? That would be awesome! I don’t mind reading them from the blog…but an ebook would be great! Thanks for sharing your complete knowledge and not withholding information. Oh yeah, putting them together as an ebook sounds like an excellent idea! Congrats on your successful project. Can you also include how much you’ve spent since site creation, especially VA costs. Thanks! Yes, I included costs on my last monthly income report; I will do the same on my April income report. Great seo work Spenser (and excellent site this is; top podcasts). Are you going to try dropshipping or buy/selling those knives or similar knives through your own ecomerce store.? With those visitor numbers you could be up over $2000/month. I’m not ready to tackle dropshipping yet. But if all continues well, I may consider it…we’ll see. Hey Spencer. Great work as always. Wondering if you could give some advice on hiring someone to build links for me (2nd tier links…like you did on this site). Thanks for all the great info! Hi Jason. Spencer said he uses layeredlinks.com which costs $219. Yes, that’s who I used. But for just the 2nd tier links you can likely find lots of services on the Warrior forum or even Fiverr. (The quality of second tier links is not real critical). I’m sorry if this is a really stupid question, but when you refer to second tier links, what does that mean? Spencer, great news man! Awesome! What would you say to a key word that has 18100 local searches, advertiser comp of 31, (according to this thing called Long Tail Pro 🙂 ), and PPC of 5.14 AND there are literally dozens of related topics with similar stats (ppc between $2 and $4 mostly). My problem is trying to figure out a good direction. Interested in a potential collaboration? Ed – I’m not sure you are looking at Advertiser competition correctly. HIGHER advertiser competition is better. (This means more advertisers). What you want to look at is how difficult it is to rank in Google. So, your keyword sounds okay (maybe), but you haven’t mentioned anything about difficulty of ranking in Google…that’s the most important part. Well done Spencer, great case study. Well written, explained and just a great result. I will be looking at the tactics outlined and really like the idea of link trading with expired domains. Do you approach the site owner directly or go via another medium? Good work mate. I’ve been a long time reader and user of LTP and can vouch for it’s usefulness. You’ve actually inspired me to replicate your process for myself and create a mini Amazon review site. I’ll blog updates about progress so people can see that Amazon is a great system to use for a stable passive income (with no chance of a Google AdSense shutdown). Super happy for you mate, it couldn’t happen to a more deserving guy. It takes a lot of courage to a project like this publicly, but it has enormous value. So where did you find the people to do the link building? I’ve been monitoring your site for a while. Excellent example and excellent case study. I would like to see an expansion on your link-building tactics (quality of your web 2.0 backlinks, social bookmark backlinks, etc. ), but great information so far! Nice one Spencer, kudos not only for the result but also providing such an in depth resource! I started a new site around the same time and have followed your entire process, my keyword was a little more competitive but currently ranking 12. Quality content seems to be the key, way less links required compared to pre panda and penguin. Hey, so great to read about you niche with so much details. You always share premium information, I love it! I am not sure if you talked about it in another post, but what about pinterest traffic? Since you are affiliated with tangible items it could be worth trying to capture pinterest or google images leads. I have never did amazon affiliate, maybe it is not worth the time and maintenance, what do you think? Pinterest is out of my zone…but I’m willing to try. I’m just getting started with Twitter for this niche site and perhaps I’ll try Pinterest as well; its not a bad idea at all. Just have to decide if its worth the time tradeoff. Very motivating update. Gives me lots of ideas. There is no doubt that the key to ranking quick like that, is that you must start by choosing focused key words that you can compete for. 2. Make sure your content engages & fulfills the search terms you want to target. Get those 2 right and SEO/back-linking will be a lot more effective. is the earning ($250) from just 1 site? Yes, the screenshot is for just the one site. (Over $250 this month so far). Great work, Spencer and massive props for your transparency and “secret sauce” sharing. You’ve finally hooked me in. I was having a discussion with someone a few days ago about making a decision to buy into something that will cost me about $200 a month. I made the statement to my friend that I could just start up (or resurrect an old) niche site and get it earning $200 a month to cover the proposed monthly increase to my budget. Well talk is cheap, it’s now time to start fishing rather than just cutting bait. More will follow. Thanks for LPT (a very satisfied user) and all the help you have shared. Thanks Dave…and best of luck getting your niche site up to $200/mth! Thanks for sharing this. I have just finished my first site and I was excited that within 10 days it was at #23 but yesterday it tanked to #53. I was disappointed but seeing this article gave me hope that it could be resurrected! I love Long Tail Pro and your great blog posts! Congrats on the success Spencer! You’re so amazing! I really like the method of using high pr domain to “trade” high quality link from established blog in the niche. I have some but didnt know about that technique. So I will apply now to attract some links to my site. You are absolutely right about the most important step. Following you, I built a niche site that ranked #1 in Google and made $93.32 in ONLY 38 days. Cool! This post comes at the same time with my latest niche website update :D… We’re enjoying the number one ranking hehe. But my earning is not comparable to you 🙁 Could you please look at my site (stated in my latest blog post, i cannot post the url here) and give me advice on how to improve the earning? Congrats on getting your site to the top of Google as well! Nothing wrong with earning close to $100 in a month…not bad at all. Your product is something I’m interested in myself, but there’s no way I’d order that online, because the shipping would kill me (I live in Hawaii). But I order knives online, because the shipping is not a big deal. Perhaps online conversions for that product are lower because of the high cost of shipping? I don’t know, but that would be my guess. That would be great if Spencer can find some time to take a look and give his opinion. But good luck, man! I’ve been reading your blog for the past week, and I’m looking forward to seeing how your 2nd niche site project (and your next one after that?) turn out. Congrats Spencer. Your hard work has finally paid off. You are really cool. People are showing fake proofs to sell stuff and make money, you are showing solid results to educate people. Biggest difference. You and Pat are my real mentors. Will visit your one day for sure. Following you crazily for my first niche site. I started my first site on around first week of March, means it’s 45 days old. I did one thing differently. I choose 2 primary keywords (wanted a backup keyword and was ready to build links to both because writing is my passion so building links won’t be that hard I suppose). I am ranked on 5th page (45th position)and 4th page (31 position) respectively. That means I selected higher competition keywords, obviously. (Fair for newbie? I think YES). I am not disappointed at all. I am ready to put hard yards on this site to get to first page for both these keywords. I already have 15 articles, and planning to post 10 more in next couple of weeks. Most amazing thing, my bounce rate is only 18.40% and avg, time spent is 3 minutes 45 seconds. So I think people are connecting to my contents. Though I only have 10 UVs from search engines. 1) If you are just starting out, go for lower exact searches. Around 2000-3000 Local exact searches. This is to have lower competition. 2) You must, must, must learn evaluating SEO competition from Spencer and Pat (Niche site duel) of SmartPassiveIncome to choose keyword with low competition. 3) Never underestimate power of great content. For me, great content is something that satisfy your audience, nothing to do with fancy writing I think. Graphics to support your information is very important. 4) Linkbuilding is easier part. So, focus on keyword research, competition analysis and quality contents before even thinking about backlinks. 5) Never underestimate yourself and what you are doing. Best part is that you are doing something progressive. Doing is more essential than just learning. You learn by doing, not do by learning. Hope this helps newbie like me. Thanks Spencer for everything on this blog. Eagerly waiting for your interview on SPI. Priyank, Your Indian Fan, Follower and Student. Wow, congrats! This whole case study has been very inspiring. I’ve used your site building tactics on my first niche site and am currently ranked #3 for my keyword and am starting to get some decent traffic. It’s pretty cool to find a system that works so thanks again for sharing. 1) Have you considered adding amazon links to the knife photos in the comparison table? I know early on you thought that having too many links on the homepage was hurting your ranking but do you think adding more links to the non-indexed page might help drive more sales? 2) Have you thought about adding reviews or other info on complementary products like whetstones or sheaths? 2. Yes, and I may do this. I get sales on related products like you mentioned already, so its a good idea. Yeah, Darren (Problogger) talked about that (targeting overlooked related products) in his series of Amazon affiliate articles recently. For his photography site, he noticed in his Amazon affiliate stats that he was getting tons of sales on the same related products over and over again, even though he wasn’t promoting those related products at all. So, seeing a great opportunity, he started actively promoting those related products too and bumped his sales up even further. Congratulations dude … Your articles are really inspiring and full of motivation for me but due to improper keyword research, I end up being nowhere ! The formula seems pretty straight forward at a high level. The first two seem achievable to me. Where I struggle as a newbie is with link building. That said, it seems like you paid someone else to do most of this. You keep referring to a “VA” which I’m guessing means Virtual Assistant? Where does one find a trustworthy VA? With all the talk about bad links penalizing you I’m weary of paying someone to link building as all the ads seem real sketchy to me. I found my VA on Odesk.com. I have him do some simple link building tasks. But for the more complicated things (most of what I mentioned in my post), I hired a link building service. (LayeredLinks.com). I didn’t mention this service in the post because the reality is that you can do exactly what I listed on your own, with your own VA, or find another service. The people I hired aren’t the magic bullet…just one option. I am curious about two things, how much did you pay writer from elance per article ? And did you research keywords for articles he wrote or did he came up with them ? Its between $12 to $15 per article. I researched the keywords. Hi Spencer, you and Pat are very inspirational. I bought LTP AND that other “I will not mention it here” software. But as you said, keyword research is where i got stuck. In fact, did not even get out of the starting blocks. Perhaps you and Pat can do a webinar on this specific topic alone. Perhaps a little more indepth for us newbies than the once you have already recorded. Part of my problem is that I am stuck in my real world niche of leadership development and cannot think beyond that. Great job and I appreciate the quality content. Would love to see you and Pat Flynn in a Niche Site Duel….you two provide the most practical and transparant content on the web, thank you! I still have not taken that first step, not very good with numbers, so I hope Long Tail Pro will help me along the way a bit more than starting from scratch. I am already working mostly from home, but niche sites might give me even more freedom. Here we go! I really appreciate you share your link building experience,BTW I like your Long Tail Pro software. Hi Spencer, i have a question about choose domain, if a org emd is available, will you use org emd or .com plus some word? wich one you will like? I would go EMD .org. I usually avoid hyphens (and just add a suffix or prefix as you suggested). Can you please let me know who you are using to build links and how much did you pay? I mentioned this a few times in the comments above. I used LayeredLinks.com; it was $219. Great work Spencer, congrats in the results. A quick question on the quality of spun articles. I assume the original article was well written, but what was the quality of the spun articles like? Would they pass human moderation? Yes, they were still pretty good (not perfect though for sure). I would call them lightly spun rather than massively spun. 1. Was the domain relevant to your niche? 2. What was its page rank (what does high mean)? 3. What does “trading” mean, is just a domain re-direct thing or did you build a site on that domain and you’re swapping articles? 4. Is it necessarily to build mass links (tier 2) to your tier 1 links? I mean, will this make a difference? Small, medium or big? 5. Won’t having one or multiple high page rank swap be better/more productive to tier 1 links rather than mass social sharing/bookmarking/submissions? 1. Yes, very relevant…that’s why it was valuable and I wanted the link. 2. The expired domain had a PR of 4 that I used. 3. I explained this in the post. Here’s my second try :). I had an expired domain of PR 4; lets call it expired4.com. I found a webmaster who wanted a link from that expired4.com to his site xyzexample.com. In exchange, the owner put a link on xyzexample.com pointing to my site, bestsurvivalknifeguide.com. 4. I don’t need that you need to massively build links, but I do think 2nd tier links make a “medium” difference. I’d like to know more about expired domains (with high page rank and traffic) if you don’t mind. How do you find them, are you using any particular services or software/web tools? is the incoming estimated traffic still continuing once you register the domain name to your webhost? how do you “monetize” these expired domains? Are those 112 items that were sold all knives? Or people just went on amazon through your affiliate link and bought a bunch of other stuff (as it usually happens). How much of it were other stuff beside knives? Most of them are knives or related items (knife sharpeners, fire starters, camping gear). As an estimate, I would say 70% are knives. Another 10 to 20% are related survival/camping gear items. The other 10% or so is unrelated/random items. What happens if those visitors (new or returning) visiting your site, and clicking on amazon links/product photo already have their Amazon shopping account, would you still get credited for the sale? Or, what happens if they order the next day (and the 24-hour cookie expires)? Yes, Amazon has a 24 hour cookie. They can do whatever they want because its their affiliate program. I’m getting a little cranky waiting for them to arrive lol. I had my fingers crossed for yesterday, but nothing. Hopefully they’ll come today. I’m okay with that 🙂 Hope they get to your soon! I’m really impressed by the fact you have laid out your strategy, tactics and results thus far. You and Pat Flynn are both brilliant Internet marketers. Spenser, this is so inspirational. It’s very encouraging when we know that still it is doable. Thanks for this and looking forward to Pat’s pod-cast. All the best with this journey. Good idea. I used the tablepress plugin to create the chart. But perhaps a post about other related details to chart and comparison shopping would be advantageous. That’s great to see, Spencer. Well deserved! Were those 15 PR4+ blog comments related to your niche? No, these blog comments were not. (The original blog comments were). please how do i check the position of my site on google? I used Long Tail Pro. http://www.longtailpro.com (the tool I created). we have to manually add the keywords we want to check ranks for isn’t it? do you plan to use an automatic ranking check option where the software will detect all ranks without us having to manually input specific keywords? Yes, we are adding auto-checking/tracking in the platinum version. Ha haaaaa! hell yeah Spencer keep crushing it bro, I hope people are paying attention. Thanks for all this valuable information. I’m learning a lot and getting inspired by you. I just can’t get that ‘expired domain’ thing. If it is expired what’s the use of it? Thanks man, you r awesome! That is a result you should be proud of…even better it’s profitable! Wow – congratulations for the #1 spot. I have only just discovered your website and this project, but I have read through it all in the past few days and just a few hours ago, I bought my first domain … all thanks to you and this project! That’s awesome to hear! Way to take action!! How many hours do you think you put in till now? I’ll do a full discussion on this on my next monthly report (in about a week or so). Congrats there Spence as always your advice top notch! Just a curious question how many visitors are you averaging a day now that you ranked #1? Great post! Thank for sharing your project. I will try to follow your step. for you next niche site project you should challenge Justin and Joe from empire flippers, it would be very interesting for the two giants in niche sites to go up against each other! Great article, interesting to see how in such a short amount of time and proper research plus some outsourced help has started earning you a passive income with Amazon sales. Terrific case study Spencer, and congratulations on your success. Just wondering, what your thoughts would be on using an established general niche website and writing individual posts that are keyword researched and SEOed the way your niche sites are? The main advantage being only one site to maintain. The disadvantage I see is using a non relevant domain name. Congrats on the success with your site! How did you find blogs that have DoFollow comment sections? I had someone else find them for me. (I hired this out). Ok, thanks Spencer. Good job with the site. Spencer – You are a ROCKSTAR. The level of detail & transparency is incredible. SURE its a case study in content marketing for your software product (LongTP) but I have to say I’m using a competitor KW/COMP tool (swiss–made analysis tool) and I still visit for your insights. You’ve inspired me to look into amazon again for the several adsense blogs I’ve got. PLEASE PLEASE keep these coming!! BY you article step by step, building links like so easy! this is an awesome post! ALL information with regards to link building is available here. Inspirational as always. Thanks for another great post! Looking forward to the next one – would definitely enjoy a post related to a brief tutorial or tips page for tablepress. Thanks again ,Spencer. Awesome job Spencer! Glad I waited a few days to comment, because all of my questions are already answered in the comments above. My take: I’m glad that you were able to prove that link building is still effective – but at the same time I am disappointed that it is still necessary to rank sites like this. For a part-timer like me, I don’t have the time, know-how or experience to do this kind of link building, and my sites don’t create enough profit yet to justify spending $219 for a link building service. I’m still trying to rank my sites with minimal and basic link building efforts. Just bought two more domains for some killer keywords I found with Long Tail Platinum! Excited to attempt to replicate your process. From your opinion and experience, do more backlinks / good backlinks increase the number of visitors on their own or are their main effects primarily on increasing the SERP ranking, thereby eventually bringing in more visitors? No, typically the links themselves dont bring in traffic (although this really depends on where the links come from). Primarily I use them to increase my SERP ranking, for my niche sites. Hi Spencer, I like your link build Strategy and the detailed steps. thank you very much! I think I found my Direction. Ok Spencer – you just sold me on the LT approach! Thank you! Awesome work and SO AMAZING the level of detail that you share. A true cook-book. This is very unique and REALLY appreciated! Best of success going towards the next milestone! Congrats, Spencer, on your success! I was flabbergasted (yes, I just used that word) that your homepage was ranked in the 20s-30s even with no backlinks. I’d picked a keyword I thought was relatively easy, but my homepage isn’t even ranked in the top 500 (even though my secondary articles are ranked in the 20-30s w/no backlinks). Did I pick too hard a keyword? Did you have any successful niche sites whose keyword main page wasn’t even in the top 500 after 3 weeks? I’m just figuring out if I should abandon this and start a new one or tough it. Thanks! FYI – I was in a similar situation – ready to give up. Then after 3 weeks my site popped up #13 in Google…BAM! Ray, it could still be too early to say. But yes, typically my homepage would be ranking in the top 500 after 3 weeks. Give it a few more weeks. Thanks a bunch for the info. Actually, I think I’ve found the culprit, same as yours–too many affiliate links! I removed them then bam, a day later, I’m ranked around 70. Now, I just need to put those affiliate links back on! You still have around 20 affiliate links (14 no-follow, 6 do-follow) on the homepage. Did you do anything special to be able to have those 20 (as opposed to the 5-8 links that Chris Guthrie recommended when you first received the penalty)? Thanks and congrats on your well-deserved success! Awesome to see a live example of how to build a website that makes money from scratch! Apreccieate the courage you had to do that and also to share your methods. I have a question for you, Spencer. I have and EMD site wich ranks #4 in Yahoo and Bing, but it’s nowhere to be found on google. I think it’s a penalty. Do you know what should I do? Is there any way I can recover? Almost sounds like a penalty to me. Its so hard to know what kind of penalty (over optimization, penguin, panda, etc), so I don’t have any specific advice. Quick question. For the articles you submit to Squidoo, etc., do you write brand new unique articles or do you submit a post from the site? New articles. NEVER use the articles that are already on your site! Nice post. I am impressed with the way you managed to bounce this project back after all that negative seo business. Thats not easy. Putting your domain in the spotlight had a lot of risks but I’m glad you managed to make it work for rather than against your rank. I will release software that does exactly what LTP does but for free. Sorry Spencer for the competition. when and why would you do such? why would you want to compete in the first place? Oh John, why must you pollute this post. If you need attention go to the warrior forum. Otherwise, until you have the so called software ready to be “given away for free”, you have nothing! Did I ever mentioned that it’s going to be a WSO? The software will be free, the only downside to the software is that it might be on a website plus it will have ads. It’s in the beta stages, got people testing it already. Hopefully once it’s launched it should be good. Your progress with this niche site has been not only very encouraging, but also incredibly helpful. I’m still trying to get my own niche site to Page 1 of Google. I’m currently at No. 16. In terms of your site, I was always suspicious that you had built more links than you had originally let on. Thanks for showing your list of links that were used. I’ve been focusing more on guest posts, comments, social bookmarking, and news releases. Perhaps I could stand to diversify further using article directories, etc. You know, you’re so right about keyword research Spencer, I spent thousands on overpowered complicated fickle tools like Senuke only to never see my sites rank, but since reading and following your method i have 3 sites earning me $100 a month and more on their way,A big thanks to you man for sharing your know how. I am still following your NSP and its great to see someone explain all the details. It is very encouraging to see that you made a website that will generate some income in just a few months. Awesome as usually, thanks for all the details… I didn’t know about LayeredLinks and I feel like using it… approximately at the moment I’m trying to build a niche in the french language and they are not covering it. 1. have you been using LayeredLinks for all your backlinking? Would you recommend it? 2. how many unique visitors have you had from 1st to 24th of April? What is your conversion rate? 1. Not all. But I have used them on a few sites. I text different link strategies ALL the time, so I may do things differently six months from now. 2. I’ll share more on this in my monthly report. Spencer, this link building you do can be done to a wesite from a different language from english ? Imagine that I have a French site, for example. Do you see any problem on making english links it? It’s really hard to find linkbuilding services for my language. Honestly, I’ve never done this, so I’m just guessing. I suspect you can still have french keyword anchor text links coming from English articles and have some positive benefit. However, ideally you will be able to publish articles in french to generate links. But even if you use English links, your site will likely improve in rank. This is somewhat an ROI type of a question, so hopefully you’ll bear with me. Right now you are adding articles and visitors are increasing w/ the potential for more. At what point do you say it is time to stop adding content because you’ve saturated the possible amount of searches that come in? It’s something like at some point you might be overdoing it (adding content, etc.) because there really isn’t more visitors/clicks that can be squeezed out of that niche. Does this concept I’m driving make sense, does it exist? And when can you tell it is time to stop adding to the site? Or am I wrong and you can keep ‘extending’ it by slowly ‘encroaching’ on related niches? Yes, it makes sense. I usually stop when I’ve covered a niche pretty well. Its something you have to test for each site, you’ll be able to see if you site is making extra money each month or not. Love your site and using it as a reference to revamp my sites. Did you link it to just one place or spread it to multiple sources that link to your site? I linked to a couple of different pages on my site, but mostly the homepage. Your site is ranking number 3 now according to long tail pro. What will you do if you get hit with an update a couple months down the road especially since you have thousands of links pointing to the site. Yes, looks like the site is still bouncing around between position 1, 2, or 3. I’ll keep everyone posted if anything further happens. Was trying to find examples of your 10x Web 2.0 Properties but didn’t have any luck. You used spun copies of the same 3 articles on all 10? Isn’t that pretty risky and obvious for tier 1? Just wondering if you can add more detail about this. I don’t think I ever provided a list of web 2.0 properties, but they are easy to find with a quick Google search. The anchor text is different for the articles, and in reality its not uncommon for the exact same article to get syndicated across hundreds (or thousands in the case of news stories) of sites. So, its actually not as big a deal as you might suspect. When tracking your ranking at the early stages of your website, for example, when it wasn’t ranked yet and at #395, what software/site do you use to track this? Hey Spencer. Thank you for sharing your journey so far. You’ve inspired me to start my own niche authority site. I have a question for you. Is it a bad idea to add Google Authorship to my new niche site? I’m wondering if it could hurt at some point down the line. I was reading an article about authorship and how it really gives a lot of credibility to sites when it comes to getting them indexed faster as well as helping them rank. Would love to hear your thoughts. I think adding Google authorship is a good idea and could actually help. I didn’t do it simply because I didn’t want my Google authorship to somehow skew the results of this public project. However, for other, I absolutely think its a good idea to add your Google Authorship to a new niche site. With web directories, are there any in particular that have a decent PR (3+) and also auto approve submissions or a short approval time, maybe 3-4 days at most? There are a ton of directories out there with lists in numerous places, but I’d be curious to know what your short list of directories would be in order to get your site included with an active backlink……….my understanding is that some of these directories can take several weeks to approve a new site submission. I just wanted to thank you for providing information about Layered Links. I am a member of Long Tail Classroom and when I saw your final report from Layered Links, I was impressed. I have 9 niche sites and only 2 of them make any money. I have done link building on all of them but always fail. I know the keyword research is good because they always rank on page 2 or 3 until I do the link building. I started a new niche website so I could follow along with Long Tail Classroom. I didn’t want to mess up the link building with this one so I hired Layered Links. It is on the expensive side but I figured that I’ll get the money back once my website hits the top 3. I ordered last week and, so far, the results have been amazing! My site is almost to the front page and LL isn’t even half way done building links yet. My site already starting to make money. I’m going to use the money from this niche site to pay Layered Links to run campaigns on my other niche sites (the ones that I didn’t totally kill off with my bad link building). So thanks again for showing me that outsourcing to someone who knows what they are doing is much better (and cheaper) than me attempting to do it myself. I want to ask, you buy a domain on February 7 but began publishing article on February 22. Is there a particular reason why you do it ? Is this included in the SEO strategy ? I was just really busy and didn’t have time to work on the site for a week or 2…no seo reason. Spencer–I’m a little unclear on something. 2) Web directories, which your VA did (can you mention where you and your VA found these web directories)? 4) Second tier or exterior link wheel, which was done via info you received from the Page SEO course. But my question is this, if someone can’t pay to do Page SEO (and it sounds like this step could also be handled by maybe Unique Article Wizard? ), how else could the second tier link wheel be accomplished? Actually mike the #4 (second tier links) was build by Layered Links as well. Hope that clears it up! But yes, you could use UAW for a second tier of links. Wow, a big congo to you Spencer. So basically the thing that worked for you to get on first page is the work of the person you hired right? Can I ask whom did you hire, and how much did you charge you to build all those links? Nope, it was the keyword research that was the most important thing that got me to #1 in Google (as explained). And I also posted in the comments earlier that I used LayeredLinks.com for link building. Trust me though, keyword research is WAY more important. Hi Spencer, I’m glad to hear someone like you say that keyword research plays such a big role. It’s kind of how I see things as well – keyword research, on-page seo and content are all king. I’ve recently started the niche site duel 2.0 challenge and I downloaded your long tail pro trial – it has been making the research a whole lot easier. Do you enable domain privacy on your money sites to help reduce your footprint? Thanks so much for all the free information you provide, LongTail Pro is awesome, I have used the free trial for the last week and plan to purchase it today! I am new to blogging, niche sites and keyword research so just looking for advice if you have the time. Some of the keywords I would like to go for look really good according to what your criteria is, so I was just wondering about the domain and page title. Most of the domians are either chain stores or magazine articles and the keyword is on the title page. If every other metric is good but the title page mentions the keyword in all of the top 10 would you still go for it. Thanks again for all the information you have already provided. Yes, if all the metrics are good – then its still doable. Thanks for giving a list of the backlinks you built. I have the biggest problems with linkbuilding but I guess I am starting to learn more about it. I’m trying it with my latest website which only gets 1300 exact searches a month but I am ranking on 13 without a backlink. But I have some questions, tier 1 are mainly blog comments, web directories and article directories? And then you build a load of links in tier 2 linking to your tier 1 pages, is this for linkjuice? I dont know how I can build so many links, I saw many are using software for this. I also saw a lot of fiverr gigs offering this. While I think it can harm if you use those links as tier 1, is it ok to use them as tier 2. It only cost 5$ and Its a use timesaver in stead of building it yourself. I am only scared it can hurt my site, what do you think? And how about the linkbuilding service you mentioned is that also useful for dutch website? I think tier 2 links are to make sure that the crawler crawls your tier 1 links that go to your website. I’ve thought of the same thing using a fiver gig. I see you’re Dutch, I also speak Dutch. Drop me an e-mail at gillesbeckers[at]hotmail.com if you want to chat a bit about online marketing in Dutch. Been keeping up on your blog, and enjoy all of the helpful information you provide (so much I have longtail platinum). I have recently deployed a niche site and I’ve published 10 articles over the past week. The first article targetting my primary keyword was published last thursday. On Tuesday this week it went from not ranked (500+ in rank checker) to ranking 73. Unfortunately over the last several days it has gone back to not being ranked. Is this behaviour that sometimes will happen when working on sites? I’m just concerned because your site steadily went up in rank once it was indexed. Its hard to say, but new sites can bounce around…I would give it a few weeks. Just build a few links and keep adding content. Did your VA use rotating titles when submitting your site to web directories? DMOZ suggests “always opt for the official name of the site” when supplying a title. That sounds like good advice. It’s a directory of websites. Anything other than the name of the site would be ambiguous – like listing yourself in the white pages under another name. I have spent a bit of time reading your posts and have a question that deals with linking – 2nd tier in particular. When hiring a service to create second tier links that point to your blog links, you mentioned they were often spammy. Doesn’t this have a negative seo effect on the blog you are pointing to in the first tier? you’ve made great post to get rank in 2 month I had few question but after reading your artical I got ans of many question.BUT you should also post artical about you backlink which you’ve used in this process. marketing with Adwords. Anyway I am adding this RSS to my email and could look out for much more of your respective exciting content. Finlay someone who typed step by step the entire procedure. Thank you very much. I got overwhelmed listening to all so called online gurus who claim to make thousands per day. This was really useful. Hats off to your effort and thank you very much for sharing this useful information. ranking in google is not easy .. its a lot of hard work ! Getting on the top in google is easier than to obtain the number 1 position . Congrats Spencer, this post is awesome! You got everything in this post about niche site succeess . Thanks for sharing. Spencer, Thanks for sharing awesome tips on creating niche sites from scratch. I have taken steps and started working on a site. I have a doubt on Squidoo lens and other articles strategies. Can please let us know how many links you suggest in these articles and how many words. Thanks again Spencer. Spencer, Thnkx for the great tips. Like most affiliate marketers in the beginning, perhaps I have bitten off more than I could chew and made sites that are far too broad in scope to rank highly in Google. I’m going to try to follow some of your tips and drill down to a more narrow niche, just need to research the profitability potential further. Fascinating article, and shows that it can be done with hard work and quite quickly as well. I’ve always had my sights set on ranking on the big keywords, however I think you’ve shown that starting off smaller can have similar effects, and I presume from there it can be a domino effect of sorts. Look forward to reading how this continues to develop. Great article. That is what I call a great start. Getting to the top can definitely be a challenge and it is not just about getting there but staying there. The competition is fierce but if you are smart enough you can push your way to the top as shown in this example. Good job. Hello Spencer, I hope you’re doing good. I know, we need to talk, the link building service you explained may be you should direct me for I need to know how to build links for my blog, which is my current project: http://onlinembaprograms.co/. I will contact you. Hey looks like your server had a prob yesterday! hopefully all’s well there! great site, i usually read a lot of tips from your site here, i just love it! you have build a great site, respect. Another sentences later,you wrote that you make an decent 5 figure income every month. 1: the niche site who makes only $20 how many sites/articles you have there? 5 articles,10, 20? 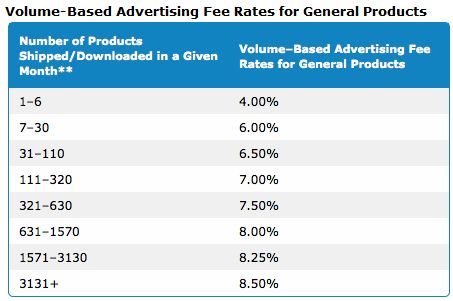 (with 10 or 20 articles Im sure most amazon affiliates earn more than $20). 2: 5 figure every month; how many different websites you have and how many articles/product revies each of these websites have? 5 articles,10, 20? 3:all of your niche website are monetized with amazon to make this 5 figure in month or do you build a list? Wow thats a really impressive feature. Who would have thought negative SEO can be so harmful to other peoples sites. Glad that there’s a tool to filter all that stuff now. In addition, I have created a website called http://wwwsilverliningsdating.com which is an free online dating website, so i know what you’re thinking, there’s loads of them about and the market is saturated, however, I believe with time and good quality SEO, why can’t i get ranking at the top of online dating in Google and start giving the big cats a run for their money. Probably the best article for keyword research and getting high PR for any niche blog. These are the best techniques that i ever watch, but there is a problem that i m facing, i m working on project management templates there is high competition but medium search, i just want to get top position in google ranking what i should do? These articles have been really inspiring me. My first website that hit #1 in google was pure luck but I’ve been working on more sites. Backlinking has definitely been the hardest part so far. i started my website a month ago. i have not been getting huge traffic as i thought my articles are not enticing, but they actually are. my site is a technology site. After stumbling upon this page, i have gotten some good tips. seeing that my website has not been penalized using the two options above gave me some relief and at least a way to check whether Google has penalized me. Why website’s ranking dropped ? Hi Spencer, just out of interest do you know how many articles you had on the site when you had your first top 50 Google ranking? I currently have a site that is sitting outside the top 100 despite having a few high quality links and my keyword isn’t super competitive. In your experience have you seen a jump in rankings after the number of articles on a site reaches a certain number? That’s tough to say. In the old days (2009/2010), I would rank with 1 article sometimes. Now I shoot for at least 15. I do believe more content can help if only because it may reduce bounce rate and increase time on site. This is awesome! Im really excited to move forward with my site. Question: Im creating my 1st niche site and I considering building a site for a service and the top 10 ranked in google aren’t local (which I think is a good sign as you suggested in one of your articles). The numbers look good but I’m concerned because the top 10 are all service providers. Would it make sense to create a directory/information site using the keywords?